Why Does My Violin Sound Squeaky? 4 Tips to Fix It! A question I get often from beginner violinists is this: How do I make my violin sound less BAD?! Fear not. 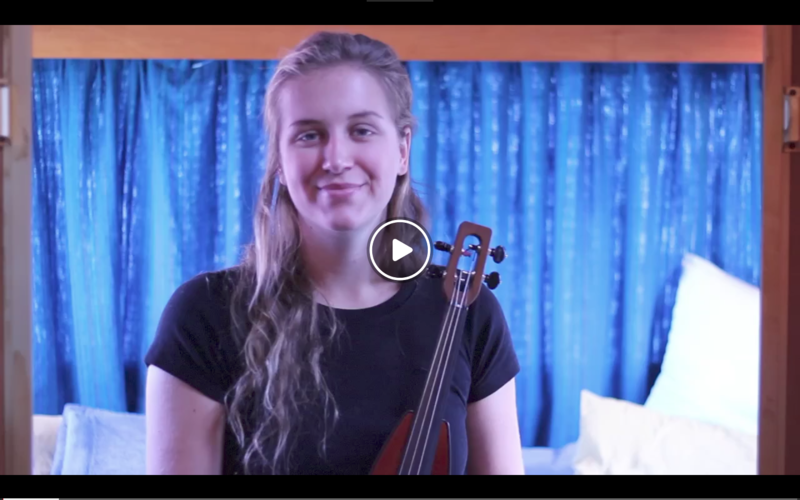 The violin is one of THE most difficult instruments to learn, so you’re not alone in this! Why exactly is it so hard? Other instruments (like piano or even guitar to a lesser extent) already HAVE their own tone. When you hit a piano key, it sounds like a piano. When you strum a guitar, it’ll sound like a guitar. But when you bow a violin… at first, it might sound like a dying cat. That’s because tone production is a huge part of learning the violin –– and it’s also why it’s so difficult to learn. Not only do you have to learn about music in general (music theory, rhythm, melody etc. ), but you have the added of challenge of, well, not sounding like a dying cat. What should you do to prevent squeaks? Preventing the “squeaky violin” sound all comes from the bow. A teacher once told me that the violin is only there to hold up the bow. That’s one of my favourite quotes, because even though it’s a bit cheeky, it’s totally true. There’s a reason why many professional violinists spend more money on their bow than on their violin. All of your sound production comes from how you handle the bow. Here are four “bowing fundamentals” to keep in mind. First and foremost is to keep your bow moving in a straight line. Don’t allow your bow to wobble around, as this will create a strange, uneven, whispery sound. 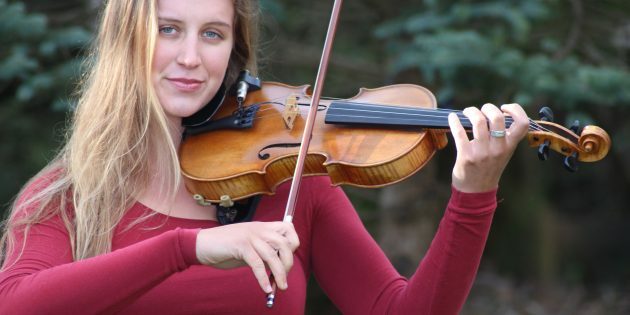 Watch any professional violinist, and notice how their bow moves as straight as an arrow. How do you do this? Push your right elbow forward as you bow downwards, and pull it back as you bow upwards. Notice how this straightens the bow out. Keep even pressure. This is a very common cause of a squeaky violin. The bow is much heavier at the frog (the bottom) than at the tip. In order to maintain even pressure throughout the bow stroke, you have to change the weight of your arm as you go. Apply more pressure closer to the tip, and less as you near the frog. How do you do this? Hold your bow in front of you, without the violin. Now, press down with your index finger. Notice how the bow moves down? Next, relieve your index finger, and press down with your pinky finger. Notice how the bow moves up? This is what you have to do while playing. Nearer the tip, press down a bit more with your index finger. Nearer the frog, press down a bit more with your pinky finger. This will add and relieve pressure, to make sure you get an even sound! When I press down with my index finger, the bow moves downwards. This effectively increases pressure on the bow at the tip. Take care when changing bow direction. Often “squeaks” will occur when you change bow direction. This is because students unknowingly add or subtract pressure from the bow when you change direction. You want to make sure that your bow changes are as seamless as possible. How do you do this? Actually, in most cases you should relieve pressure from the bow just a tiny bit when you change bow direction. This is to de-emphasize the harsh interruption in sound you get when you change bows. Of course, some bow techniques (like staccato) don’t require relieved pressure. BUT, I find for my beginner violinists, the problem is usually too much pressure on the bow when changing direction, causing harsh, clunky, and squeaky transitions. Slow your bow down, and imagine very softly picking it up from the string. As soon as you’ve changed direction, then resume normal bow pressure. Mind the elbow! When you change strings, make sure your arm is moving as a whole unit. This is a very common mistake!! Your right arm should always create a straight line from your bow. This means -– don’t let your elbow sag by your side, pulling your whole bow downwards. When you let your elbow sag, it throws off the balance of the whole bow, and all that stuff about applying even pressure will be pretty much impossible. This ALSO means that as you change strings, you will need to move your arm up and down as needed. 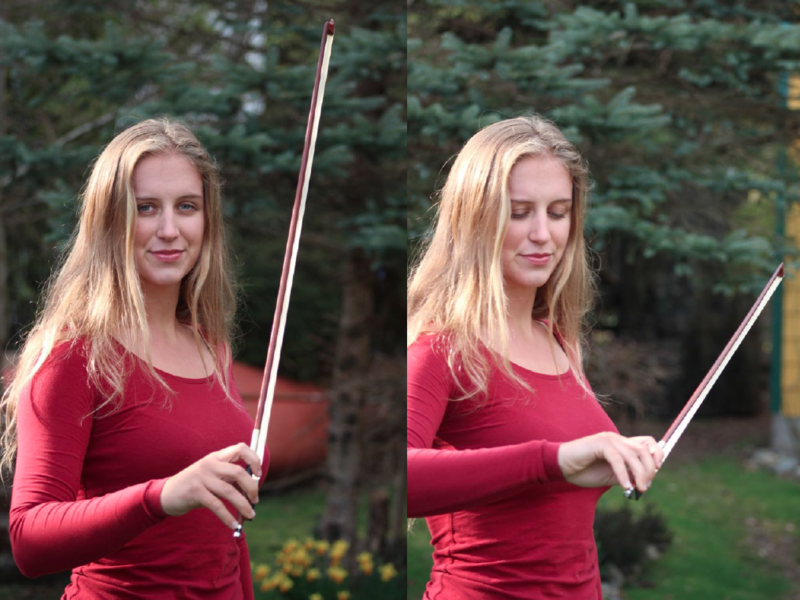 When you’re on the G string, your arm will be pretty high up to stay on the same level as the bow. On the E string, your arm will be much closer to your side. How do you do this? Practice in front of a mirror. Start on the E string. Your elbow should be quite near your side. Move the bow to the A string. Your elbow should move up with it. Next, D string. Again, elbow should move up. On the G string, your elbow should be almost as high as your shoulder, in order to keep up with the bow! Do you want more tips to sound way more confident on the violin? I’ve got more free books and blog posts just for you! Check out this whole page of free resources.